Hello, Marvel fans! 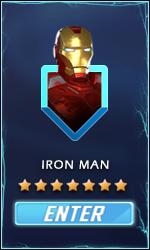 Today we will talk about best team synergies in Marvel Strike Force. If you played Marvel Strike Force more than one day you probably realized that the most important thing is the composition of your team. The more you get into the game, it becomes clear that there are groups of heroes who cooperate with each other with significantly better results and that team synergy is more important than team power. You must have immediately concluded that an Avenger hero works best with another Avenger hero same as HAND, S.H.I.E.L.D or A.I.M. characters (you concluded correctly) but there are other, much stronger symbioses between heroes in this game. I made 9 different team compositions for the most important segments of the game (currently). As you will see most of the teams I will suggest can be obtained even though you are a free-to-play player. Note: Click on the hero images for the full info. If you want to beat any team composition you are facing on your Arena list you will choose this team. Point is that no one (except protectors, but when they are alone on the battlefield you already won) can survive Crossbones', Vision's, Wasp's and Yondu's AOE together under the effect of Offense Up from Kingpin. This combo, when maximized, do at least 110k damage. 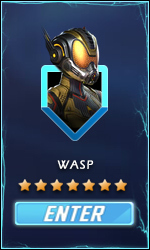 Above all that, Vision applies Defense Up on self, Crossbones, and Wasp making your team extra tough. Use Vision's ability block to prevent heroes like Luke Cage or Captain America to cast Defense Upon a whole enemy team, if possible. With this team, you can beat any other team with similar power (even Defenders and S.H.I.E.L.D) except Brotherhood of Mutants for which you will need to replace Yondu with Drax who should be placed in a corner so Magneto ultimate must be cast on him. 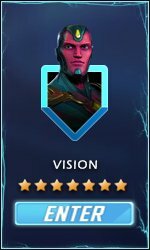 If you fight against Brotherhood of Mutants be sure to put Vision in the other corner in order that he avoid being blind by Magneto ultimate and he can cast Ability Block in the first turn. 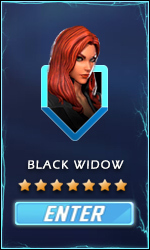 Most of the people when they see Black Widow and Hand Sentry in the same team just pick another target because Black Widow mass speed and Hand Sentry mass evade seems unbeatable. However, there is a team composition which counters them and can beat almost any other team – Captain America, Black Widow, Vision, Quake, and Dr.Starnge. Black Widow always applies Speed Up to Avengers allies which means that Vision and Captain America will play before enemy Hand Sentry. Vision then casts Ability Block on Hand Sentry making him useless while Dr. Strange flip enemy Black Widow mass Speed Up into nasty debuffs on the whole enemy team. With Quake, you slow other priority targets and your goal is to kill Hand Sentry as soon as possible which is an easy task. Captain America always provides Vision and Black Widow with additional energy and he applies Defense Up on 4 allies making the team resistant to AOE damage. With this team, you don’t do heavy damage but you are always in control of the situation and the enemy team have so many debuffs that there is no chance for you to lose the battle. Scientist Supreme counters this team but you will not see her often, so if you have resources for assembling this team don’t hesitate. It is very hard to assemble a proper team for Arena defense because an A.I. could never play as a human and you must realize that there will be always someone who can beat your Arena team. However, there are some team combinations (like this one) which can be very powerful even in the computer hands. 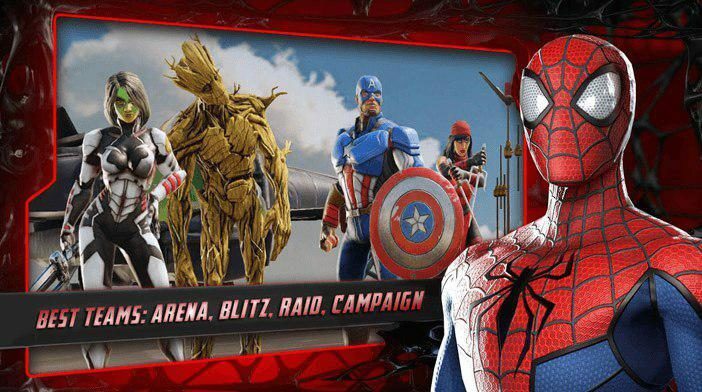 With Spider-Man computer always use chain attack in the first round and Spider-Man applies Defense Down on four enemies for 2 turns. 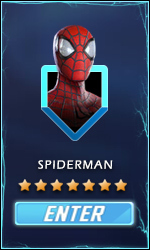 Spider-man also has enormous dodge rate so he can survive if he is lucky. 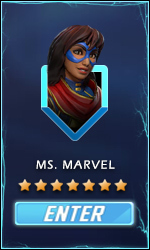 Ms. Marvel has nice AOE which is always cast in the first round on enemies with Defense Down and she assists after Daredevil and Spider-Man turn while one of them assists on her turn. 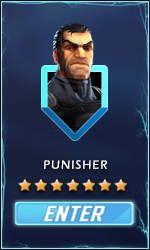 Punisher deals extra damage against villains and provides bonus damage for City Hero allies. 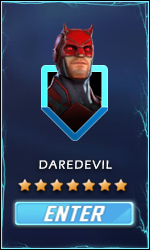 Also, he has devastating AOE which is cast in the first turn always against enemies with Defense Down and he attacks anyone who strikes Daredevil. Above all that, Punisher assists after every non-combat skill cast by his allies (Luke Cage, Ms. Marvel). Daredevil initiates fights with his devastating ultimate and Luke Cage has great synergy with defenders and Punisher. 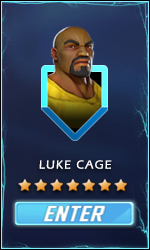 Luke Cage Defense Up often is not needed at all because enemy team is ruined in the first turn but if needed, Luke can protect his allies for the second turn of battle. A computer will play almost the same as you because all skills are cats in the order you would cast and that is the beauty of this team. Of course, some teams will be able to beat you (TECH team for example) but you will be avoided almost always. This is a perfect team for Raids if you can assemble these characters together. Captain America and Black Widow have synergy with other Avengers which means that Vision and Iron Man will cast their AOE every second turn with enhanced effect while they are hastened all the time. Night Nurse is only non-Avenger member and Captain will also provide her with energy every time he taunts enabling her to cast mass-heal every second turn. With this team, every existing raid is a piece of cake. If you are a free-to-play player and you want to have a team capable of beating every raid without using health packs this is the right team for you. All these characters are already on your roster and together they make great synergy. Drax begins every fight with taunt. Quake is the best controller and with her slow, she controls every battle. 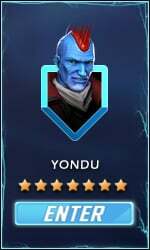 Yondu has decent AOE and can summon minions with massive damage every second turn. What makes this team special is Mercenary Lieutenant–Deadpool combo. 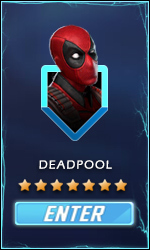 Deadpool is the best hero when you fight minions because he always crits them and additionally he heal himself every time he has a debuff on self. 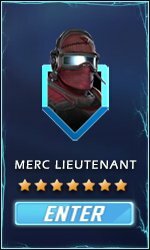 Mercenary Lieutenant provides the whole team with Offense Up and he has a passive ability which gives him 30% chance to heal each ally each turn with even greater healing for other mercenaries (Deadpool is a mercenary). In short, you will slice through nodes like through butter. This team is probably the most used team in the game currently and that is for a good reason. All these characters can be easily farmed early in the game, except Captain America who can be replaced with Drax until you open him, and together they have a great synergy. In this team we have 3 powerful AOEs (Crossbones, Yondu, and Quake), Quake controls the flow of the battle with Slow and we have Gamora who can inflict tremendous damage to the single primary target with all of her abilities. Captain America fills the team with additional ability energy and protects other allies with Taunt and Defense Up (as I said before he can be replaced with Drax but Drax is not good as him), while Yondu can clear enemy positive effects with his first skill. This team is a sure-to-win team for new players in Blitz but it is not as strong as it used to be. Recently in Blitz, we have more and more teams with greater Synergy and this team can be used with success only in the first 2 months of playing Later on when you enter in Blitz with serious players you will need a stronger team, but this team will do just fine until that. All characters in this team have Tech trait and after the 1.4 update Tech heroes with Vision in a team are ridiculously strong because Vision grants them Defense Up for 2 turns at the start of each combat. 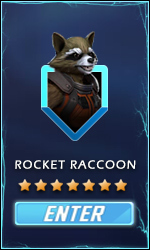 Aside from that in this team we also have offensive buffs from Mercenary Lieutenant (Offense Up and Speed Up) and we have Star-Lord – Rocket Raccoon synergy. 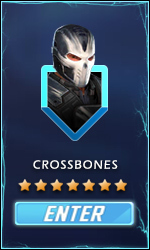 Crossbones is the only protector in the team but his main role is to detonate in the second round right after Vision ultimate which also hits all enemies for 250% of Vision base damage. If done properly, both AOEs are cast while Crossbones and Vision are under the effect of Mercenary Lieutenant Offense Up. Additionally, in this team, we have Star-Lord and Rocket Racoon who are capable of eliminating 1 enemy at the start of the combat. Be sure to put Rocket Raccoon next to Star-Lord Because Star-Lord generates ability energy to adjacent allies and enables Rocket Raccoon to cast his ultimate in the second turn under the effect of Offense Up. With this team, you will not have difficulties to farm Blitz even on T8 tier. 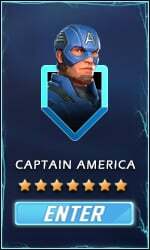 At the end of Hero Campaign, there is a mission with Captain America shards and it is vital for all new players to finish this campaign as soon as possible. This team is easy to obtain and it is verified that it can pass all the mission in the Hero campaign. 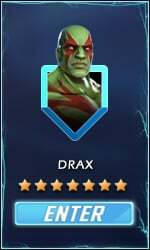 Drax and Quake are gained from the Arena Store and they control the flow of every battle. 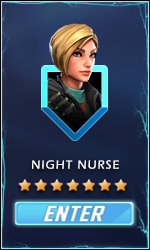 Night Nurse can be also obtained early via 3-9 Villains United mission and she grants 3 stars for every mission. Gamora is kinda expensive but she can be farmed in a Blitz Store and she is the main damage dealer while Spider-Man is a hero who is now very strong and who is with you from the beginning. There are better Hero teams, of course, but this team is easiest to obtain especially if you are a new free-to-play player and you should strive towards this characters from the beginning of the game for multiple reasons. 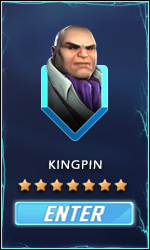 At the end of Villains United Campaign, there is a mission with Kingpin shards and Kingpin is a top tier hero everyone wants to acquire. This team is made of characters who are with you from the beginning of the game and who are capable of clearing all missions in Villains United Campaign. About Yondu, Crossbones and Mercenary Lieutenant all are said earlier. 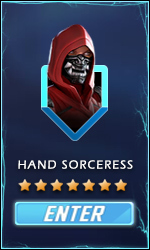 Hand Sorceress is a very good healer who applies Defense Up to allies and Elektra is capable of doing all remained tasks in this team. This team is meant for new players and it is capable of clearing all missions with three stars.